This page is a collection of links to discussions and reviews on GPS devices and related accessories for the Nikon D300 by users and owners. Best GPS options for the D300? Power supply solution — is the device powered by its own internal battery? Is Heading data recorded? Heading is the angle in which the device is pointing at. Does the device come with a built-in, 10-pin connector that plugs directly into the remote port of the D300? Because if it doesn’t, this is an additional cost item. … it is all done automatically and with ViewNX or PhotoME, I can automatically jump to Google earth and see my location, then download the google earth kmz file, convert to .gpx and bring it into my topographical software. Read KRMicros’ review of the Solmeta N2 GPS. Douglas has more details on cold and warm startup times, Almanac and Ephemeris data, accuracy with Wide Area Augmentation System (WAAS) of the Solmeta vs a Trimble Pathfinder ProXRT Receiver. Alternative solutions are to plug information from Garmin Map products into a standard handheld GPS devices. GPS data loggers are another solution, but you’ll need to spend additional time at the computer syncing the geotag information from the logger to the photos based on date and time data using software such as the RoboGeo. Garmin eTrex Legend C (C stands for Color) handheld GPS units cannot be used on the D300. According to “ron2000”, this is because, the C series does not have a serial port, which is the only means of connecting to the camera for data output. An example of a Garmin handheld device that has a serial socket is the Garmin GPSMap 60CSx Handheld GPS Navigator in addition to a standard mini-USB port. 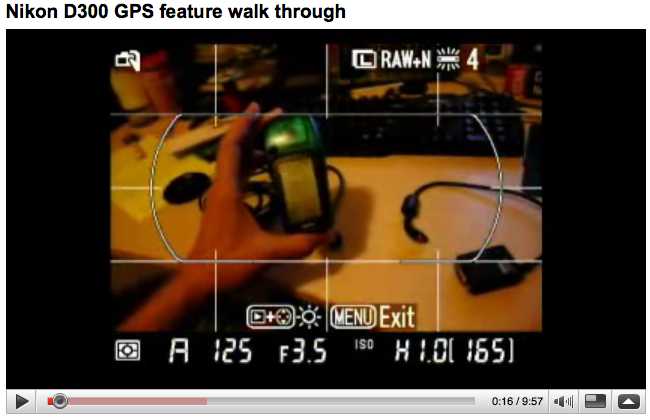 The following clip shows clearly how you’d operate the various GPS devices and accessories, connecting the device to the D300, and the required camera settings.